Tisbury voters support short-term rental inspections at first night of town meeting. 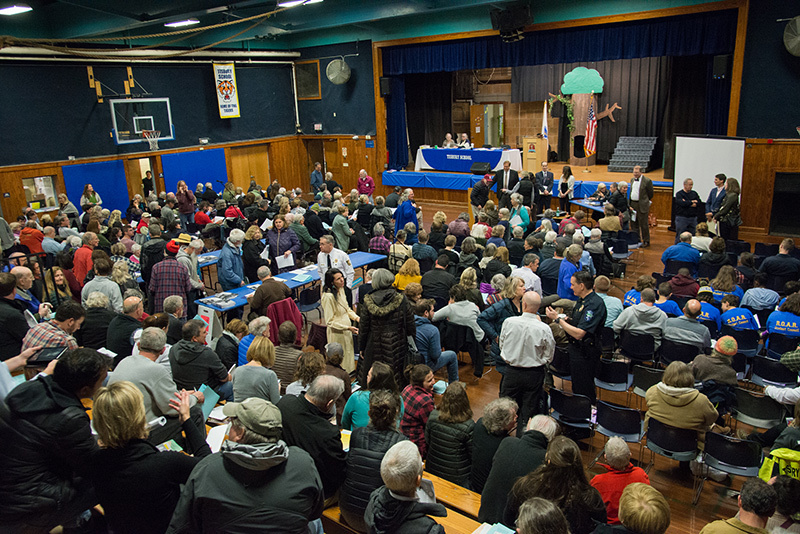 It was a packed gymnasium at Tisbury School for the opening night of town meeting. 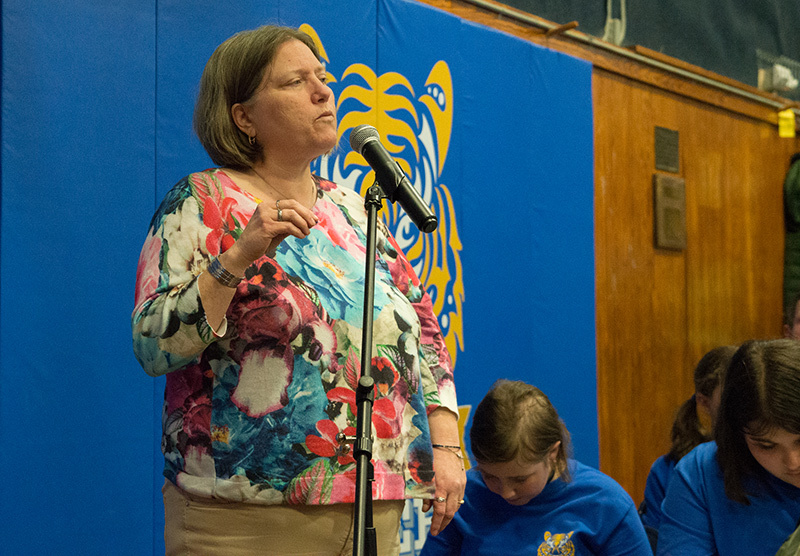 Town moderator Deborah Medders keeps things moving during one of the article debates. The town's assistant assessor Ann Marie Cywinksi explains an article that sought to tax personal property. Voters rejected the change. Selectman Tristan Israel makes his case for an appointed town clerk as Town Clerk Hillary Conklin watches in the distance. 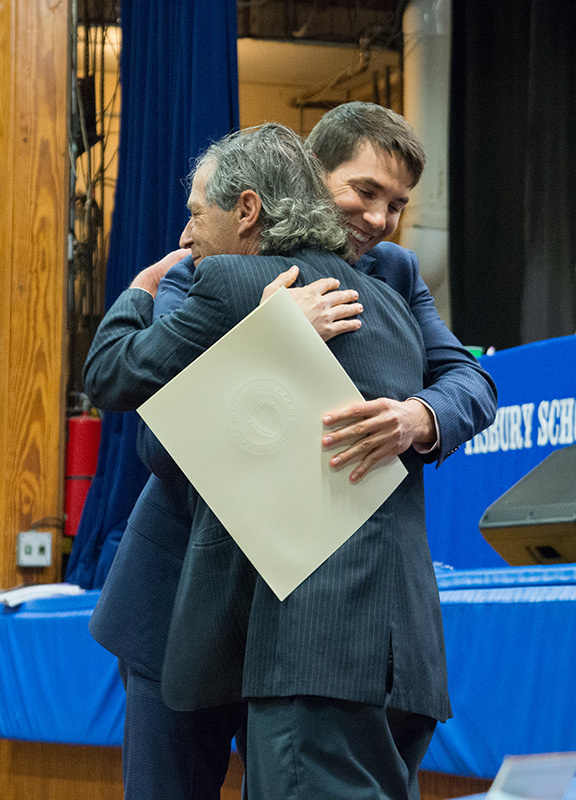 State Rep. Dylan Fernandes gives selectman Tristan Israel a hug after presenting him with a proclamation voted on by the House and Senate. 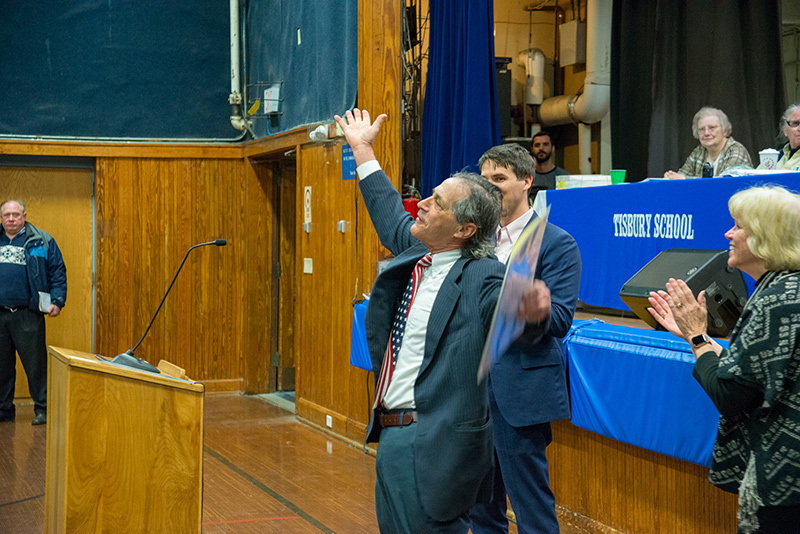 Retiring selectman Tristan Israel salutes the crowd at town meeting Tuesday night at Tisbury School gymnasium. 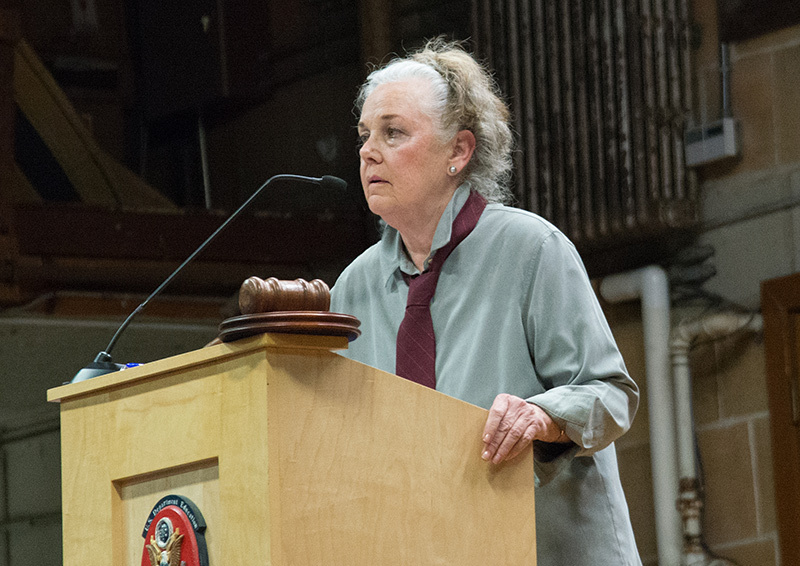 Voters rejected the idea of appointing rather than electing the town clerk during Tuesday’s first night of town meeting inside the Tisbury School gymnasium. Town Clerk Hillary Conklin spoke out against the article, which was proposed by selectman Tristan Israel, whom she described as a friend. Politics shouldn’t be part of a position that oversees elections, she said. “It would be awkward at best to report to selectmen, who appear on the ballot, and a conflict of interest at worst,” Conklin said. She asked Israel to trust the process and voters, noting he was elected to nine terms. In support of his proposal, Israel said the job requires expertise, particularly in a town with a budget of $28 million. “It has no reflection on the great job that she does,” he said of Conklin. In a vote of 197-114, the town approved safety and health regulations for short-term rental units in town. The article generated some spirited debate. The article was sponsored by Fire Chief John Schilling and health agent Maura Valley. Selectmen will set the registration fee, and violations of the health and safety regulations will result in a $100 fine. The inspections would put short-term rentals on par with bed and breakfast inns. “The feeling was if you’re going to rent out short-term, you should meet safety requirements as a licensed bed and breakfast,” she said. Voters rejected an article brought forward by Jeremie Rogers, son of selectman Jim Rogers, to block off Oak Hill Avenue to through traffic. Rogers said commercial vehicles are using it as a cut-through. Voters expressed concern that there was not enough information. You’ll be able to get a bloody mary or a mimosa with your brunch at the Black Dog Tavern on Sunday mornings beginning at 10 am, thanks to a voice vote at town meeting. One very enthusiastic voter moved the question almost as quickly as moderator Deborah Medders finished reading the article. That prompted some knowing laughs in the crowd, which exceeded 300 voters for much of the night. Once they got into the annual town meeting warrant, they only got through the first five articles. Voters approved spending $307,550 in embarkation funds, money the town gets from a 50 cent surcharge on Steamship Authority passenger tickets. Discussion did get briefly bogged down as town meeting debated forcing the SSA to spend more to help with dredging Vineyard Haven Harbor. In a long and detailed article funding various Community Preservation projects, including $25,000 for restoration of a 1949 fire truck and $20,000 to repair the Christ United Methodist Church, among others, voters removed $75,000 to be spent on a bike path between Beach Road and Lagoon Pond Road. 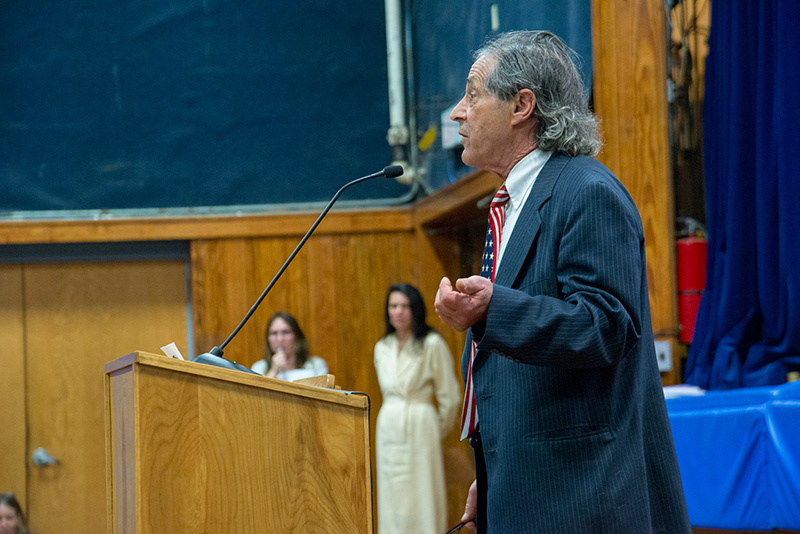 Voters were swayed by Rogers, who said the town may be able to make a deal with the developer looking to redevelop the Hinckley property on Beach Road. The start of town meeting was delayed as voters were signed in at the front door and a line snaked outside. It was also slow to begin while the town recognized Israel for his 24 years as a selectman in town. State Rep. Dylan Fernandes, D-Falmouth, read a proclamation passed by the House and Senate. “It’s a bit long, but in the spirit of celebrating Tristan Israel, it should be a little long-winded, I think,” he said to laughs. Town meeting will continue at 7 pm Wednesday inside the Tisbury School gym. Date corrected of first night of town meeting. -Ed.